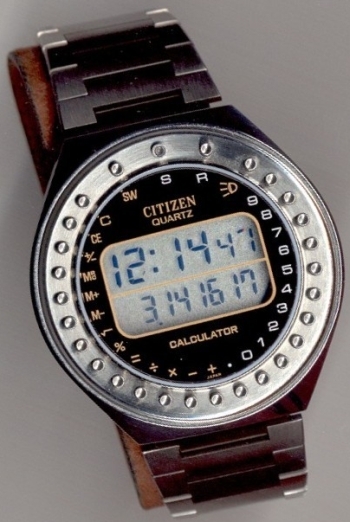 Citizen Round Remarkable design from 1978; first Citizen calculator watch. 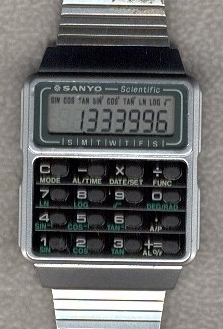 Sanyo Scientific Tricky to operate Scientific, c. 1985. 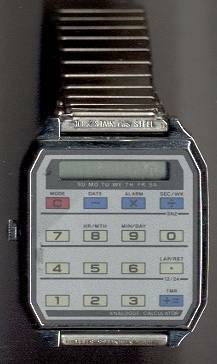 Seiko C359 Stylus-operated alarm-calc, c. 1979. 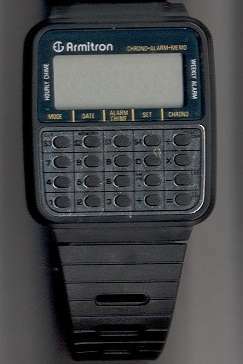 Pulsar Y739 With in-clasp Stylus, also sold under Alba brand, c. 1979. Armitron Wrist-Comp 101 Armitron’s “Data Bank”, c. 1985. 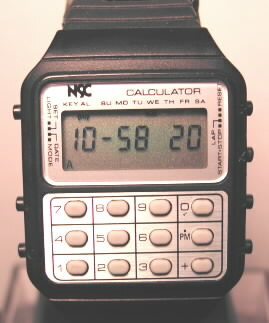 NSC Calculator Watch One of their last consumer products, c. 1983. 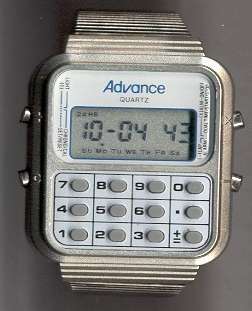 Advance Calculator Watch Popular discount department store make. 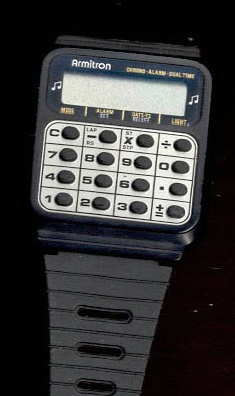 Jupiter Calculator Watch Multi-function melody; dropped to $10 by 1983. 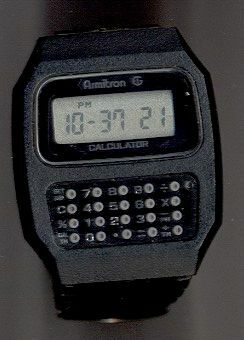 Armitron Melody Calculator Watch Alarm/chronograph/dual time zone, c. 1983. 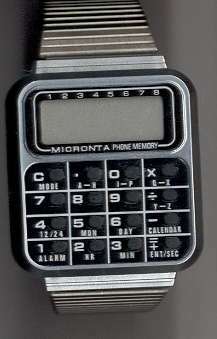 Micronta Phone Memory Calculator Watch Radio Shack’s “Data Bank”, c. 1985. 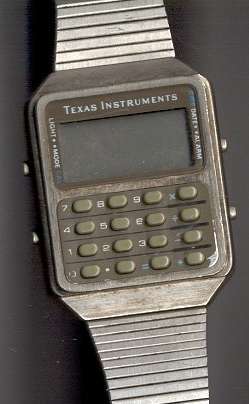 Texas Instruments Calculator Watch As TI withdraws from watch market, 1982. 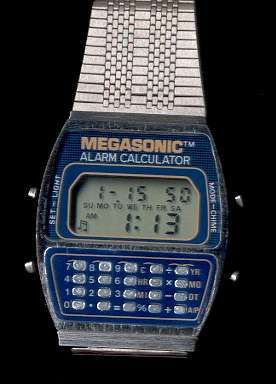 Megasonic Calculator Watch Sold by Sharper Image for $89 in 1981. 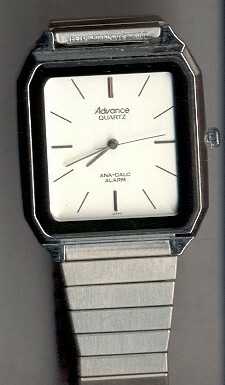 Advance Chrono-Alarm From 1984, $14.98 @ Discount Store Zayre. 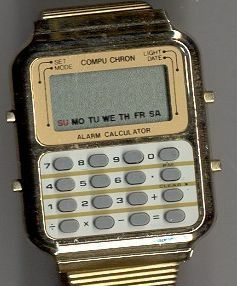 CompuChron Calculator Watch 1983 Zayre Special, $21.98 (tag on back!). 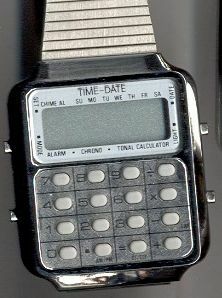 Time-Date Unimaginative, Cheap-o Ames store find, c. 1984. 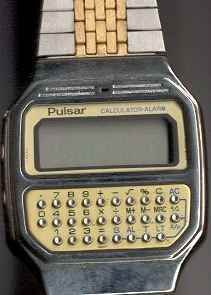 Armitron Budget Remember Caldor? 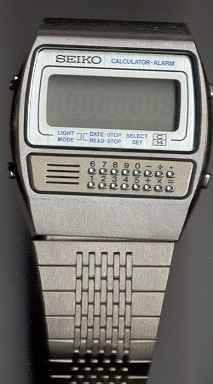 About $8 in 1984. Advance Calc-Chrono Another Cheapie by Advance. 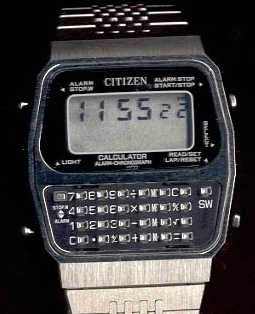 Citizen 9190 Large alarm/chrono/calc; also sold under Vega make, c. 1979. 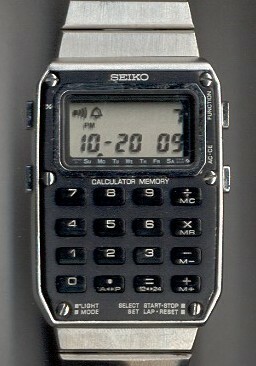 Seiko C515 Large button multi-function, c. 1982. 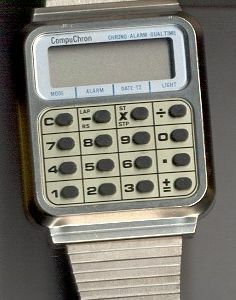 Seiko C153 Seiko’s first calc, no alarm, stylus-operated, c. 1977. 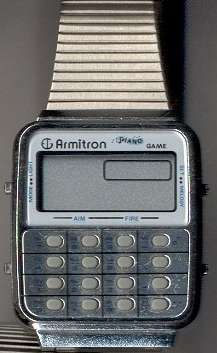 Armitron Piano-Game Watch 13-Note keypad, Invader game, c. 1983. 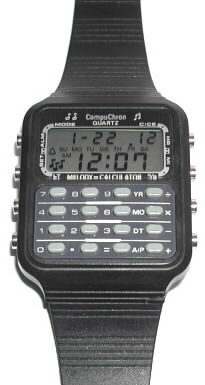 Micronta Calculator Watch Mid-80s long-running calc watch from Radio Shack. 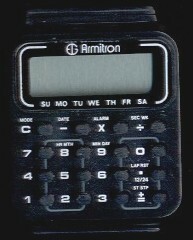 Armitron 20-Button Ailing sales = add more buttons, c. 1984. 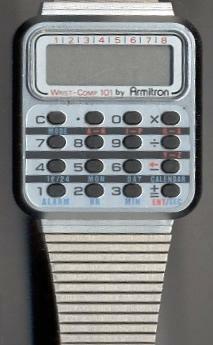 Compu Chron LCD Later Model Calc Watch by Unisonic, c. 1983. 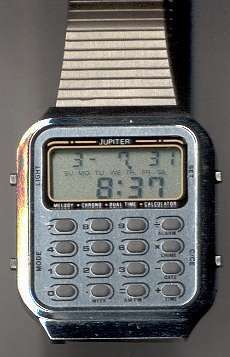 CompuChron Musical Same Display & Features as Jupiter, c. 1982. 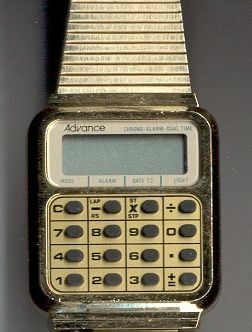 Advanace Ana-Calc “Hidden” Calc, Analog w/Digital Back, c. 1985. 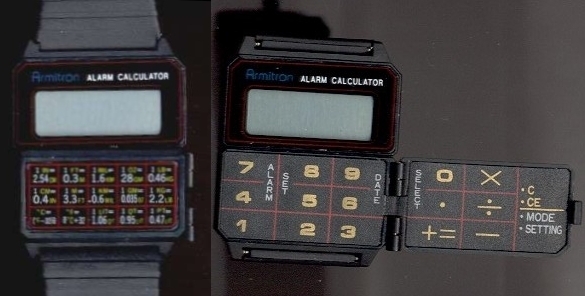 1980 Armitron Calculator Watch Their earliest; an homage to the Citizen 9190? 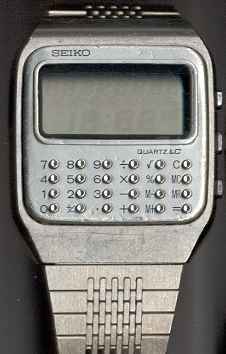 Armitron Hidden Keypad Calc Watch Concealed Membrane Keyboard, c. 1985. 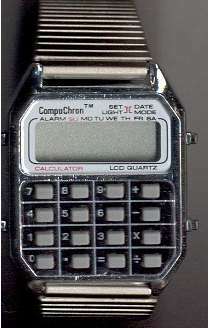 CompuChron Calculator Watch 3 Common practice of same module, different nameplate. 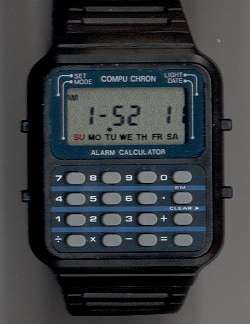 Compu Chron Calculator Watch 4 Last of Unisonic’s offerings: $9.98 in 1984. 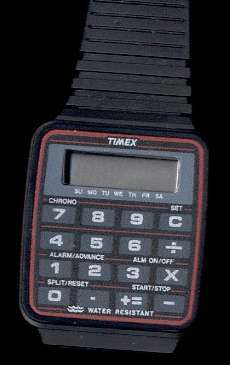 1985 Timex Calc Watch Finally, a water-resistant chrono-alarm from Timex; c. 1985. 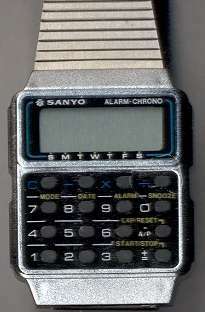 Sanyo Alarm-Chrono Basic features; post-fad calculator watch. 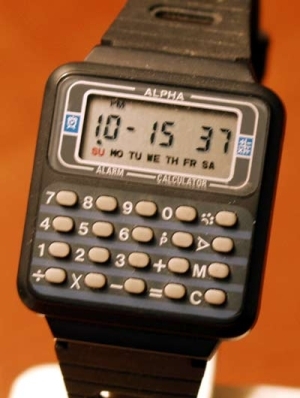 Alpha Calc-Chrono Calc Chrono; NOT Y2K-Compliant. 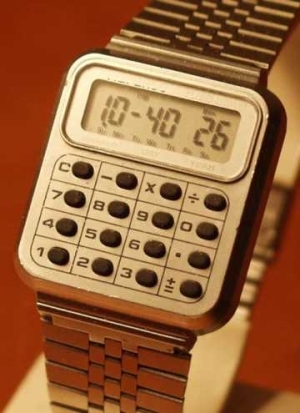 Need sme advise just bought a mint lynx alarm caculater watch date on it says 1980 hve seen alot like it but not same square black plastic lynx across top any idea of its worth?